Is anyone else in complete denial that tomorrow is the last day of 2014? I can't believe how fast this year has flown by, and in true fashion, I've been so focused on Christmas that I roll into new year's eve feeling generally unprepared and burned out. Even though hosting another party or cooking an extravagant meal is the furthest thing from my mind, I still like to put together a little something special to celebrate the new year. A nice bottle of bubbly and an appetizer or two are just the thing to casually enjoy at home or with a small group of friends in order to mark the passing of another year. 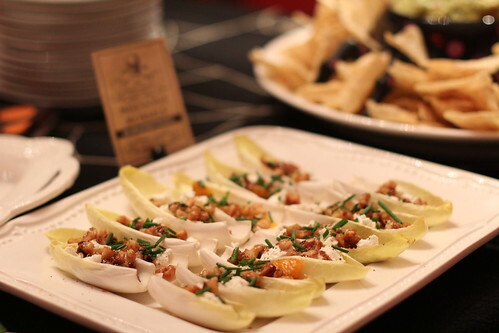 One of my go to appetizers that looks elegant, tastes great, yet is relatively simple and easy to assemble is this recipe for walnut and goat cheese stuffed endives. 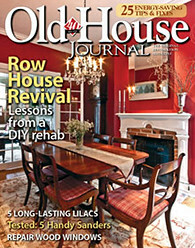 It's great for gatherings at any time of year, and can be easily doubled to accommodate larger groups. Coat a baking sheet with cooking spray. Combine walnuts and 1 tablespoon of the honey and spread in an even layer on the baking sheet. 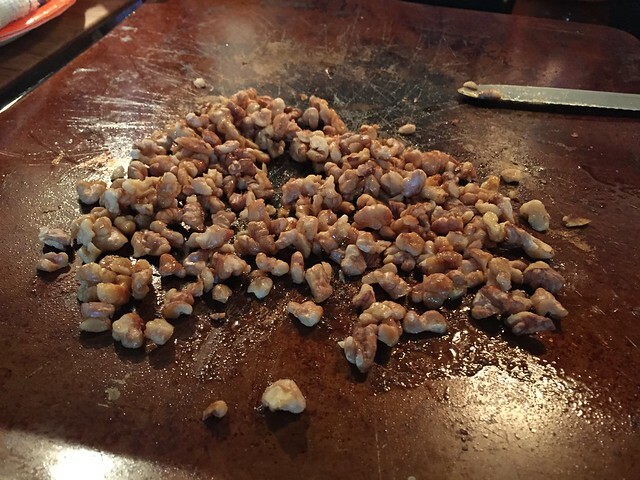 Bake at 350° for 10 minutes, stirring after 5 minutes, or until the walnuts turn golden brown. While the walnuts are baking, combine the remaining tablespoon of honey, vinegar, and 3 tablespoons juice from the mandarin cup in a small saucepan. Bring mixture to a boil over high heat, and cook until reduced to 3 tablespoons (about 5 minutes). Wash the endives and carefully peel the leaves, cutting off and discarding the core. 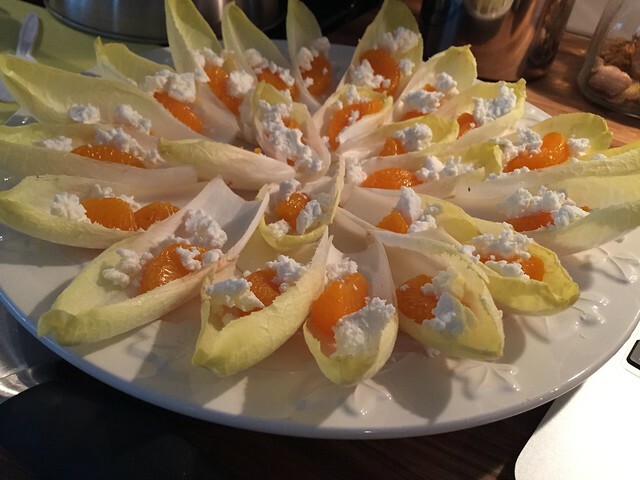 Fill each endive leaf with 1 mandarin orange section. (Note: I've also made these with fresh cut orange sections and freshly squeezed juice. It's a great alternative and tastes better, but it's a lot more time consuming.) 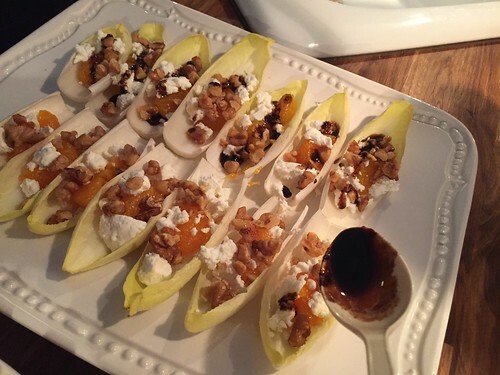 Top each section with 1 teaspoon goat cheese and 1 teaspoon walnuts; arrange on a plate. Drizzle the vinegar mixture evenly over leaves, and sprinkle evenly with chives and pepper. Sprinkle with chopped chives and freshly cracked black pepper, and serve slightly chilled or at room temperature. No matter your plans tomorrow night, we wish you a happy, healthy, and safe new year! Interested in low key entertaining ideas for New Year's Eve? Check out my No Fuss NYE Menu tutorial. Looking for other easy appetizers? 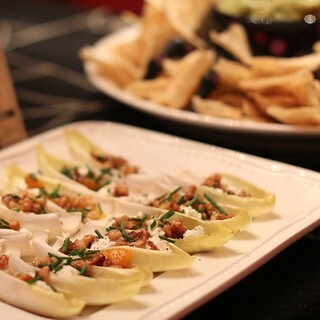 Take a look at these recipes for Bite Sized Brie Bites, Gorgonzola Stuffed Dates, or our Recipes, Cockails, and Entertaining page for more ideas. :) Thanks so much, Franki! Happy New Year!